There's something oddly comforting about relaxing in silence at home. The TV is off and it's just me and the computer... I like it. I actually feel at peace! This dress I spotted on Emma Watson (my idol/bff). After seeing it on her, I knew I had to have it. Lo and behold, it was by Juicy Couture. Don't get me wrong, I used to wear their track suits in middle school, but I haven't really ventured into their ready to wear clothing... ever. May I state, I was pleasantly surprised when this dress arrived. It's perfection. Bravo Juicy, I see your talents far extend track wear (aka the Long Island uniform). That's one cute little dress! ... of course it had to be JC, so my taste! Love the pop of neon! Oh I love the Cambridge Satchels! Really considering getting it in purple! 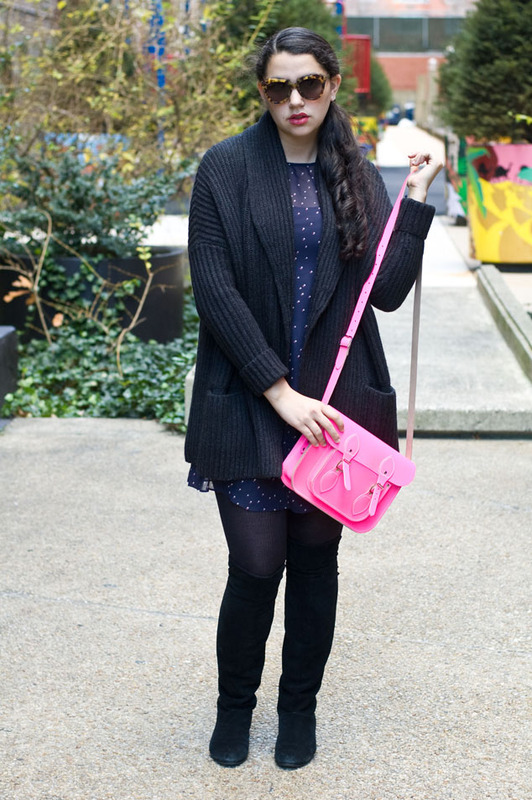 LOVE that pink bag with this outfit! Way to mix in some Spring! This dress is all kinds of fantastic with that Vince sweater and Cambridge Satchel. I love how Emma wore it, too. And I must have some good karma coming my way, because it's still available in my size at Piperlime. I can totally justify buying it as an early v-day present to myself, right? Right?! cute look...so happy to have found your blog - now following you! Sooo in love with your cambridge satchel! And I love your sheer dress! So beautiful. omg awesome outfit! I LOVE that bag! i love your pink satchel!! !